Gill Lewis, author of Gorilla Dawn describes herself as “a vet, wild life enthusiast and tree house dweller” (http://www.gilllewis.com/web/biography/). Remarkably, these qualities are brought into play in this fast paced and intensely gripping novel for Young Adult readers. Gorilla Dawn is set in Africa, specifically, the Democratic Republic of Congo, a region naturally endowed with wild life and mineral resources, especially the most sought after Coltan, a valued item in electronic products manufacturing. Two young characters stand out in Gorilla Dawn. The girl, Imara, is a captive of the Black Mamba, an armed rebel group. She is the “Spirit Child” whose duty is to protect the members from danger. Imara is deformed by a scar running across her face. Another character, Bobo, is a 14 year old boy. He desires to be a park ranger like his father. 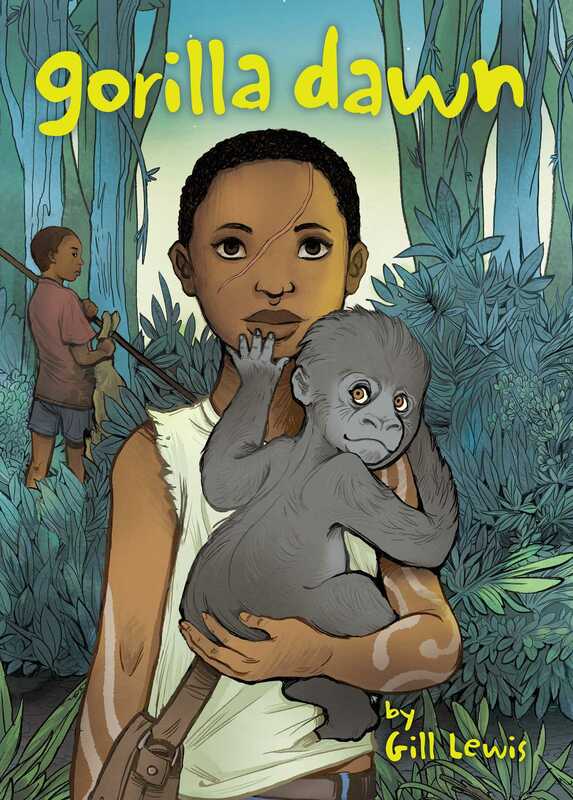 When his father is falsely charged for colluding with the Black Mambas, Bobo sets out to prove his innocence. His mission provides an interesting twist to the plot of the story. Gorilla Dawn also uncovers the role of International capitalists represented by White Lioness, the avaricious foreign buyer whose primary goal is to purchase Coltan and baby gorillas. White Lioness exerts her power through weapons sales. Her dealings with the Black Mambas is unscrupulous. Thematically, Gorilla Dawn is enriched by the classic themes of conflict between good and evil, innocence and experience. More importantly, the author draws her readers’ attention to environmental concerns and the protection of endangered wild life. This overarching theme establishes the uniqueness of Gorilla Dawn. In addition to its intense beginning, the story exhibits other noteworthy strengths. For instance, its alternating chapters bring the viewpoints of central characters into focus, thereby, broadening plot action and understanding of the major conflicts. Gorilla Dawn also captivates by the vivid descriptions of lush landscape and the representation of Nature as facilitator in the capture of antagonists. This is a story about friendship and the power of bonding that brings about good. It is about caring for oppressed subjects and understanding the interconnections of humans and the natural world. It pays tribute to park rangers and wild life conservationists that protect wildlife in DRC and elsewhere. It is also a well-crafted and passionate story, a call to stop human devastation of the ecosystem. However, the reader might find perplexing, Imara’s characterization as “Spirit Child” inhabited by a demon. At the beginning of Gorilla Dawn, this might lead to hasty and negative conclusions about Imara whose good nature and captive story gradually unfold. Overall, the author makes clear that preserving our ecosystem is an imperative task, and all hands must be on deck, both young and old. Every reader must deal with the questions that Bobo’s father asks him: “What is my part in this? How am I going to use this day, to make tomorrow a better world?” (Author’s italics 64). These are the big questions in Gorilla Dawn. Lewis calls her readers to action. She offers a positive vision of a new dawn for the nation and its tropical wild life. Also, the reader will gain important global and political knowledge from the writer’s postscript, as well as a generous sneak peak of her new novel, Scarlet Ibis.